Bob was the founder of the Chicago based group "Cooly Cool", which was originally formed with bassist Darryl Jones of the Rolling Stones, and keyboardist/saxophonist Ari Brown of Elvin Jones' group. Bob has since formed the group "Lake Effect" with keyboardist/composer Neil Artwick. Bob has worked with CBS recording artist Patty Smith and Scandal, Polygram artist John Waite, and Nile Rogers Productions. Nile Rogers introduced Bob to Felicia Collins of the "David Letterman Show" band and together they wrote as a team for Nile Rogers Productions. While living in New York, Bob had his own feature column in "Guitar World Magazine" for over two years. Bob now lives and works out of Chicago with "Lake Effect" and the new group "School of Cool" led by Miles Davis alumni, keyboardist/composer Robert Irving III. Bob is the featured guitarist on the video for John Secada's summer tour video on the EMI Records Group label. This video has been shown internationally. Bob has been touring in Europe and Japan with "School of Cool" and has played the Montreux Jazz Festival 2000. Neil was born in Tokyo,Japan, and although his family was there for only a short time, the influence can be felt in his zen-like approach to life and music. While getting started in the Chicago music scene, he spent his days studying classical piano and composition at the American Conservatory of Music, and his nights playing the clubs with local artists as diverse as the blue-eyed soul of Nicholas Tremulis, the dance diva Suzanne Palmer, and many other jazz, rock, and R&B acts. Chicago guitar legend Richie Davis introduced Neil to Butch Stewart of JoyArt Music, and his studio career was off and running. A top call session player, Neil has played, written, or produced hundreds of commercial spots for TV and radio, as well as scoring for A&E's Biography, American Justice, many PBS series, and independent films. His keyboard work can be heard on the Oprah show theme and "bumpers". Neil has also worked the "show biz" scene, backing Broadway stars such as Bernadette Peters, Martin Short, and Keith Carradine. He has also recorded with Luther Vandross, Michael Jackson, Al Jarreau, Mavis Staples and BeBe & CeCe Wynans. "Lake Effect" represents Neil's long time collaboration with a great guitarist and friend, Bob Davis. 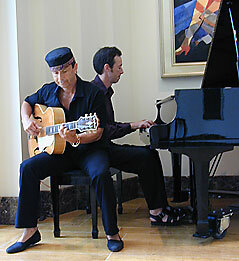 Bob and Neil have developed a unique blend of melody and groove within the smooth jazz genre, that excites players and listeners alike. Enjoy the music, and look for great things to happen with this fabulous group!